There’s this word that some motorcyclists use, maybe you’ve heard it. FARKLE. It’s a noun (“hey, check out my newest farkle”) and a verb (“yeah, haven’t had time to farkle this bike yet”) – and quite possibly an adjective, too (“dude, that farkley bike is out of control”). Those of you familiar with the word, skip this paragraph. Those of you unfamiliar, here’s an explanation. A farkle is a bit or bob, some accessory, which you affix (or have affixed by a qualified professional) to your motorcycle. The farkle can be entirely utilitarian (crash bars) or it can be eminently excessive (full-sized laptop computer). I have often used the word to describe something that isn’t quite necessary, but makes life aboard your bike easier for you in some way. I don’t always use the word in a complimentary fashion, though; it kind of depends on the farkle. “Farkling,” then, in the process by which you attach farkles to your motorcycle. There you go – noun and verb. From my perspective, the first GPS unit isn’t a farkle, because you need that. It could be your smartphone strapped to a RAM mount or it could be a high-end, manufacturer-branded electronic unit integrated into the dash. That last comment covers everything from the BMW Navigator VI to Indian’s 7″ “infotainment” setup on their 2017 bikes. Technically, if it comes from the factory that way, it shouldn’t be called a farkle, but I digress. My point is this: farkles can be something you truly need or they can be something you simply want. You need aux lights, you want a cup holder. They’re still farkles. Which brings me to my point – I have seen, installed and personally use so many farkles that I’m jaded. Their mere existence often escapes my notice, and that extends from other people’s motorcycles to the dozens of press releases touting new products I receive in my email inbox on a weekly basis. 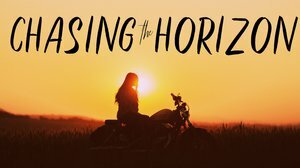 For one to hit my email and catch my attention is a rare occurrence, yet that’s exactly what happened when I glanced at the email for the Beeline Moto. Regular listeners will know I’ve talked with guests about crowdfunding campaigns before (Episode 6, Daniel Rintz, and Episode 20, Eric Ristau & Neil Olson), so it’s not a surprise that this episode involves another one. This time it’s a farkle, though, not a film, and frankly, I can’t wait to get my hands on it. Tom Putnam and his partner Mark Jenner tackled the problem of bicycle riders not having handy, affordable options for getting directions. They came up with the original Beeline a few years back and marketed it at what people in the UK call “push bike” riders – bicyclists. The idea is simple – lots of people don’t want to mount their smartphone to the handlebar, but they need a navigation aid that is unobtrusive and easy to affix and remove. Beeline to the rescue: the handlebar unit is small, easy to put on and take off, and it connects to an app on your phone (safely tucked in an inside pocket, out of site & harm’s way). The Beeline sports two modes – turn by turn or as the crow flies – Beeline mode, if you will. Turn by turn is simple enough. Beeline mode just shows you what direction you need to travel to reach your destination and YOU figure out which roads you want to take to achieve your goal. It’s incredibly simple, and the unit itself is easy to use. 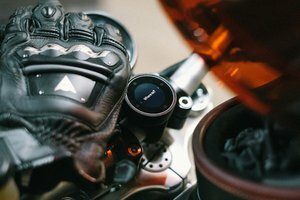 So much so that motorcycle riders started pestering Tom and Mark for a more rugged version for their use, one that could stand up to the vibration, speed and weather conditions encountered by motorcycle riders. They asked, and Beeline answered with the Beeline Moto. 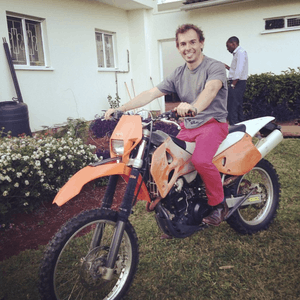 I thought it looked like such a cool idea I had to get Tom on the show, and he made time to join us and talk about his time bombing around on a motorcycle in Africa and the Beeline Moto as well. 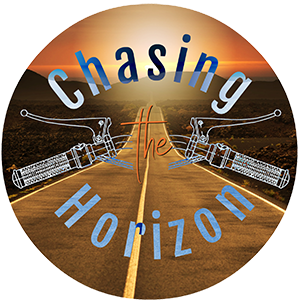 There’s a good bit of news in this episode as well, starting with Harley-Davidson’s announcement they’re looking into offshoring more motorcycle production as a result of recent tariffs put in place by the European Union. Don’t worry, I don’t get political – just the facts. Polaris announced they’re looking into doing the same with Indian, so it’s a hot topic in the news right now. There’s also info about a rash of new bikes from Ducati, Norton, Royal Enfield and KTM – and a bit of trivia, too. MOA Membership Plug: Brian Hinton asks us to share our motorcycling experiences and maybe even join the MOA at their annual rally, 12-15 July in Des Moines, Iowa. You don’t need to be a member to attend (though you get a discount on the entry fee if you are an MOA member), and you just might win a new motorcycle just by showing up! BONUS LINK: Montrose (fronted by a young Samuel Roy Hagar) wants you to get on your Bad Motor Scooter and ride! There will be at least one more episode in Season One, and it will be out sometime around the end of July or the beginning of August. My guest on that show will be Susanna Schick, a journalist who writes about lots of two-wheeled topics. Susanna is a big fan of electric motorcycles, so I got her talking about how useful they really are. Check it out – you might be surprised!